Priv ate or group voice lessons, is one of the two a better option? You will hear many opinions along the way, but it really depends on your learning style and what you are looking to achieve. 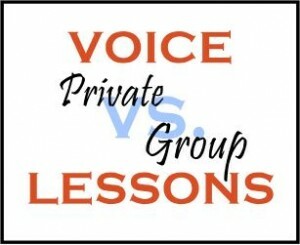 As many of you may already know, I am currently taking a group voice class as well as private lessons. Up until this point, I’ve never taken a group class like the one I’m in now. It’s been an exceptional opportunity to receive instructor feedback personally as well as to hear advice given to others in the class. It’s also been lots of fun to sing as a group with others who enjoy singing as much as I do. My private voice lessons have been invaluable. Each week my pinpointed struggles can receive focused attention through one-on-one instruction. Both of opportunities have given me wonderful insights, but which one is best for you? I will leave that decision up to you. But there are some things to consider when making your choice, and I’ve pulled together some of my thoughts to help you make the most ideal choice. Move at Your Own Pace–When you take private lessons, you will probably have some input into the songs you work on each week. The freedom of song choice allows for vocal exploration of range as well trying out new styles and genres. You will also be able to move at your own pace as you move through the songs. This aspect of private lessons has been especially important to me—I like to spend time working to prefect a song I am struggling with instead of just moving forward at the pre-determined pace. And if a song just has me feeling overwhelmed, we move on to something different and make a plan to come back to it later. Another great aspect to taking private lessons is the ability to change things up from week to week. Sometimes instead of working on something new, I can just focus on touching up songs from my book. Something that is definitely necessary for a prepared performer! One-On-One Confidence Building–Sometimes performers are uncomfortable to sing in front of anyone for fear of making a mistake. By seeking out an instructor with whom you feel safe, private lessons can provide a place to work on performing skills as well as build your confidence as a vocalist. By the way, I have worked with a number of private instructors, and choosing one that makes you feel at ease when you are with them is super important. If you find yourself unable to relax, feel uncomfortable, or you’re just not growing as a vocalist/performer, it’s probably time to try out another instructor. Sometimes this takes time to find the right one, but it’s worth the effort. Receiving Immediate Detailed Feedback–A private instructor who knows your voice and its limits is a considerable benefit as you work on your voice. Each week as you work together, specific areas can be focused on with immediate detailed feedback. This is especially important when it comes to stopping bad habits or nipping them in the bud before they take root. Singing Solo–Private lesson have been absolutely invaluable for me! Through singing solo each week with my instructor I have grown immensely. One thing I must admit though, while I do enjoy singing solo, there are times I’ve wished I could sing duets and trios with other singers. Cost–The cost for private lessons varies depending upon the teacher. Typically, the price of a private lesson is higher than that of a group class, but this is to be expected when you are receiving personalized attention and feedback. Pacing with the Group–In a group voice class, students learn the provided material and work to prepare songs by the assigned dates. Songs are usually chosen as a group or by the instructor. If students struggle with certain aspects of the song, there may or may not be time for the instructor to pause and focus on specific struggles. Building Confidence Alongside Others–The fear of singing in front of others plagues close to 75% of people, but for some, singing in a comfortable group situation can significantly build confidence. Lessons with a group offer a time to hear and see the struggles others go through. Watching others provides timid or new vocalists a time to see first-hand how the vocal training process works. I have watched people go from extreme nervousness to confidently singing in front of the group to then performing with confidence in front of an audience. Learning through Observation–In a group class, instructors will usually teach students the basics of how to properly use their vocal instrument. You can expect them to help identify their vocal range and provide feedback to the group as a whole. There may be times when individual feedback is given when necessary, but as a general rule, the individual is not the primary focus. Observing fellow students as they work through exercises and techniques can be a great way to learn. Recently during warm-ups I noticed another student using resonation exercises that I had never seen before. I decided to include them into my daily warm-up routine, and discovered they helped clear my tone. New techniques—such as harmonization— can be tried within a group situation that would otherwise be difficult to achieve. Sing with Others–Obviously, in a group class, you have the opportunity to sing with others. Sometimes there can be frustrations, but usually it’s just plain fun to sing with others. A group class allows you to be with others who share your love for singing, making it a great place to develop friendships. Cost–Like private lessons, the cost for a group class varies, depending upon where the class is taken. Typically, you can expect a group class to be less than price of a private lesson. Deciding whether or not a group voice class or a private lesson is a better fit for you and your lifestyle can be difficult. There are probably many other considerations than those that I’ve listed above, but I hope that knowing a little more of what my experience has been will be of help to you. Shine on, prepared performers! Click here for more for more from Jes!